Sandy Alfaia has sewn for as long as she can remember and very much enjoys making clothes. After making a tie quilt while she was in high school in Niles, Michigan, she studied Art and Design at the University of Michigan. In 2009, when she and her sister Pam traveled through Amish country in Pennsylvania, Sandy was amazed when she saw all the ways there are to design and make a quilt. That’s when a new passion for quilting began to take root. 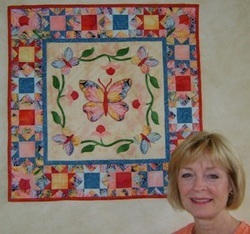 As a starter, Pam suggested they each make a challenge quilt, so Sandy appliqued (a favorite technique) and hand-quilted a miniature butterfly quilt which holds a place of honor as her “first” challenge quilt. Also in 2009, her family moved to Naperville, so she googled “quilting in Naperville” and found Riverwalk Quilters Guild. Determined to reach her first meeting, she drove through a blizzard on 75th Street. When she arrived, Kathy Herbach saw her uncertainty, invited her to sit with her, and a friendship was born. Since then Sandy has contributed time to the guild over several years by lining up speakers, organizing workshops and providing publicity. Well-armed with a passion for art that was nurtured through education and later work as an animation artist at Disney Studios, Sandy enjoys telling stories through her quilts. Reaching for the Stars tells a story and was another successful challenge quilt. 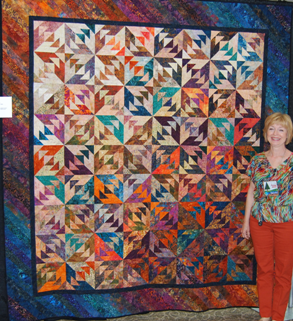 It placed in the top eight quilts for the guild's 2014 member quilt challenge, "Reach for the Stars". She claims to be disorganized and scattered, but patterns, fabric colors, and especially challenges, keep her moving toward her goals. She always sews with a purpose in mind and a self-imposed deadline helps to keep her on task. Her Quarter-Inch Queens bee is close by when she needs a second opinion. Her next objective is to master free motion quilting.